Welcome to the exciting world of Aquaponics. Our goal is to provide you with a series of seminars and workshops that will provide you with the knowledge and skills needed to enter into this hobby with confidence and ease. Our workshops are perfect for individuals of any background or skill level. We work very hard to make sure that all questions are answered and that every person is 100% satisfied with their experience. For 2014, we have listend to our students and we are going to start offering our classes back-to-back over a single weekend. As such, you are welcome to sign up for individual classes or for the whole weekend. This is YOUR learning experience — come to the sessions that YOU want to. 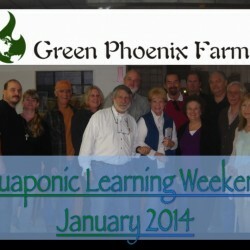 Below is the schedule for our first Aquaponics Learning Weekend (January 2014), and soon, we will be posting additional events on our “Education” page (top right of the menu bar). Look for some great classes and seminars on a wide variety of subjects relating specifically to Aquaponics and others that are related to all things Sustainable! So, if you have thought that Aquaponics might be something that you would like to try, but didn’t know where to start this weekend session would be a great time for you to begin. The truth is, that even if you know a little about Aquaponics, these workshops will give you a much greater grasp on system mechanics and the capabilities of the same. This weekend we will be offering four different seminars / workshops. You are welcome to attend an individual workshop, but there will be a discount for attending the entire weekend. Each individual Seminar/Workshop comes with a Printed Manual and our 100% Money Back Promise. If you are not completely satisfied with your experience, we will refund your money in full. Please review the descriptions below and we hope to see you all at the Workshops! In this seminar, will have four (4) hours of instruction, where we will cover everything that you need to know to go home to operate your own Aquaponic system. The 30+ page manual for this session covers the following information in detail: System Options and Configurations; Types of Aquaponic Systems; Physical Components and Equipment; Living Components – Plants and Animals; How to Cycle Your System; Ongoing Maintainence; and Basic Troubleshooting. This seminar will cover the basics of how to grow plants efficiently and productively in Aquaponic systems. Specifically, we will discuss the most effective methods for growing a variety of different vegetable types here in North Texas, and then the discussion will shift to a discussion of the options available for growing them. A focus will be presented on how to identify and correct nutrient deficiencies and for companion plantings that will help to increase the productivity of an aquaponic system. Finally sources for quality seeds, both conventional and Heirloom will be presented. This is an advanced content class that will provide you with the specific tools and calculations necessary to design and build your own CUSTOM Aquaponic system from scratch. The goal of this class is for the student to be able to design for optimal efficiency, instead of simple functionality. Calculations for fish tank to grow bed to fish load and planting density will be covered, along with those for head height and fluid friction. In this session, participants will work to practive the skills needed to build a small Aquaponic system using lumber and pond liner. Particpants will learn the techniques necessary to install liner with ease and confidence. The manual for this session will include the design specifications for the system built during the workshop.